The Crooked River Co-op - Eclectic by Design. Since October 2013, we have been building a huge eclectic collection of antiques, collectables and handmade goods which now fills two huge floors in the historic former Village Hall at 358 Broad Street in Waverly, NY. Since then we have become a destination for shoppers and collectors in the region. 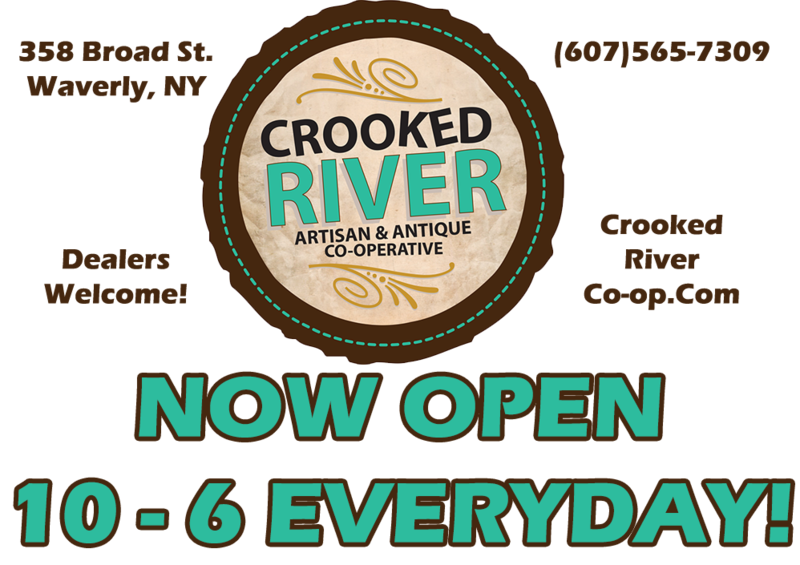 The Crooked River Co-Op, is developed in conjunction with TEAOGA Development in downtown Waverly, NY! This co-op is created to encourage, support and promote fine local and regional artisans and their work and to provide great local antiques (we even host estate sales!) while promoting the revitalization of downtown Waverly. Antique Sellers and Dealers: We have several antique dealers from around the area adding items to the co-op on a weekly basis because of the outstanding sales. If you would like to sell antiques in our co-op, contact us today to learn more! Artisans: We have a wide array of diverse artisans from all backgrounds who want the opportunity to sell their hand-made wares in the co-op and share their creativity through demonstrations, workshops and special events - and if you are a talented artist looking for the support we are offering - contact us today to learn more!